When it comes to the care of a sensitive skin the matter becomes more serious and requires special attention than any other skin types because of its more sensible nature and features. 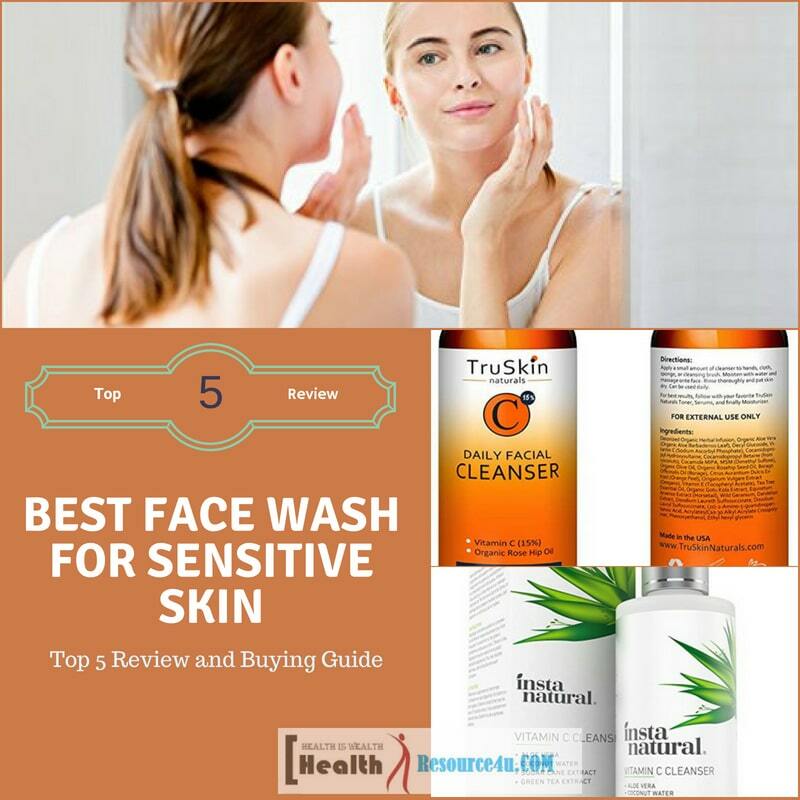 If you also have a sensitive skin and you are not getting an appropriate cleanser for it then check out our review for five best face wash for sensitive skin. In your skin care kit, face-wash plays the most important role than any other product as it is the dust and extra oil of our skin which causes numerous skin issues such as blackheads, whiteheads, pimples etc. All these issues can be relived with a perfect cleanser or face wash. Sensitive skin needs a very tender and special care, so it is very important for you before buying any product for it to read its ingredients carefully as any harsh chemical content of a product can cause damages to your face badly. In order to solve your sensitive skin care issue here, we have enlisted top most reliable and safe face washes which will not only cleans your deep sensitive pores but also ensure its care by properly moisturizing it and hydrating it deeply. It will really be an amazing thing if you get every solution of your skin problem under or through a single product. The Insta Natural Vitamin C Facial Cleanser is a perfect skin care product which is even suitable for a super sensitive skin type. This face wash cleans your skin by deep penetration process and keeps it nourished and hydrated for longer hours. 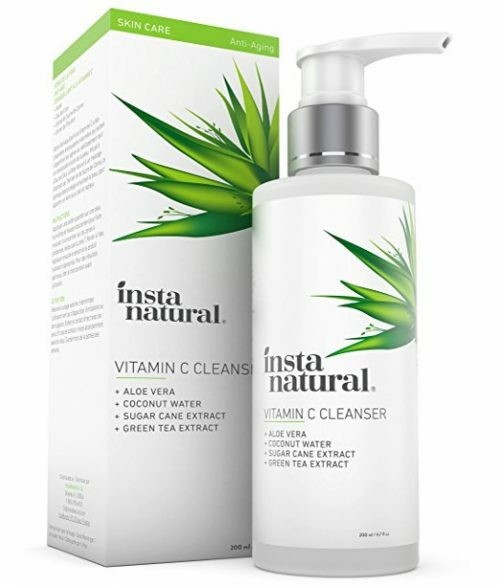 The Insta Natural Vitamin C Facial Cleanser claims to give complete care and protection to your skin by keeping all your skin issues at bay such as wrinkles, dark spots, breakout, pimples, dryness and large pores. Along with deep cleansing of your skin, it also keeps it supple and hydrated along with Vitamin c and aloe content of this product. It is suitable for all skin types. The Insta Natural Vitamin C Facial Cleanser is especially manufactured considering full protection aspect so that in any situation it won’t call to any unusual side effect or elevate to any of your existing skin issues. It is free of harsh and toxic chemicals which generally provide temporary benefits but in the long run affect badly to your soft and tender skin cells. Instead, all its ingredients are absolutely safe and natural to keep your skin beautiful and protected naturally. Its primary ingredients include Aloe Vera Leaf Juice, Cocamidopropyl Hydroxysultaine, Aqua, Decyl Glucoside, Glycerin, Camellia Sinensis Leaf Extract, Coco-Glucoside, Rosa Centifolia Flower Extract, Cocos Nucifera (Coconut) Fruit Juice, Cucumis Sativus (Cucumber) Fruit Extract, Sodium Methyl Cocoyl Taurate, Disodium Laureth Sulfosuccinate, Hydroxyacetophenone, Limonene etc. This face wash has fulfilled all the expectations of its users and that is why its users prefer to order this product again and again. As it is good for all type of skin so it has a long list of customers. This multipurpose face cleanser is one stop solution for its users as people don’t have to use any additional moisturizer or toner after its use because it tones and moisturizes the skin cells deeply for the long hours. It cleans your skin cells deeply. It keeps your skin hydrated with Vitamin C and Aloe content. It tones your skin pores and cells with oil and water extract of this product. It helps to reduce wrinkles, fine lines, aging, and sunspots. It shrinks the large skin pores. It reduces and cleans blackheads. It rejuvenates your skin cells to give it younger look. Few users notice dryness in their skin after its use. If you are a very conscious person about your skin and especially when your skin is sensitive then try this product as it will resolve all your skin problems within a few days. Also, it will improve your skin tone and texture by keeping it perfectly nourished, cleaned and hydrated all the time. This is a must recommendable product for our readers. 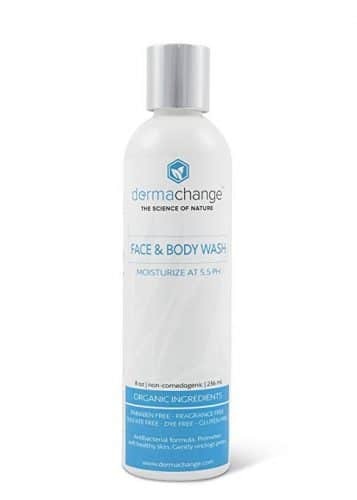 The Derma Change Face and Body Wash is another effective and safe best face wash for sensitive skin types. This product is specially formulated based on organic and natural ingredients so that it can provide gentle care and cleansing facility to your face and body. It fulfills all the necessity of your especial skin by ensuring complete protection and care of it. The Derma Change Face and Body Wash claim to provide deep cleansing of your face and body along with its perfect infusion of Manuka honey and Aloe Vera. It fights against the primary issues of your skin in order to keep it protected and for the youthful look. It ensures even tone and lighter complexion with its regular usage. This face wash or cleanser contains organic and light ingredients and free of harsh chemicals so that your skin issues can be healed through its gentle and tender care. Also, it enhances the pH level of your skin for ensuring a healthier and better glowing look. It contains Aloe Vera Gel, Coconut oil, Glycerin, Leptospermum Scoparium Mel, Decyl Glucoside, Cehami, Sodium Benzoate, Manihot Esculenta, Iron Oxide, Mica, Cellulose Gum, Sodium Hyaluronate, Titanium Dioxide, Gluconolactone etc. People who have used this face and body wash have a very positive view as they noticed an amazing reduction in their skin blemishes, larger pores, blackheads and dry and sagging skin problems. Its effective ingredients exfoliate your skin cells to remove dry and dull outer cell of skin for marinating firm, smooth and toned skin texture. Also, it keeps especial care of your sensitive skin by deep nourishing its cells and pores. It has dual benefit as one can use it for both face and body wash. It makes your skin tone and texture smoother. It reduces your large skin pores. It cleans the skin cells deeply. It keeps your skin nourished and moisturized. It keeps your skin hydrated with aloe content. It is free of harsh chemicals. It contains organic and natural safe ingredients. It maintains your skin glow with a 5.5 pH level balance. Few users don’t find it effective as a cleanser. This face wash or cleanser is rich with all the essential features and quality which is important to maintain the health and beauty of your sensitive skin. So buy this product in order to get spot free, smoother, lighter tone youthful skin forever. The TruSkin Naturals Daily Facial Cleanser and Face Wash is another best face wash for the sensitive skin type. If you are the one who wants to get rid of your increasing aging sign on skin then this is the perfect product for you. It will not only cleans your skin deeply but also reduce wrinkles, blackheads, spots and sagging issue with its regular usage. 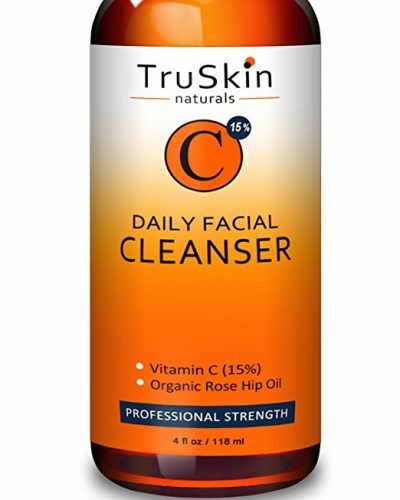 The TruSkin Naturals Daily Facial Cleanser claims that it is rich with anti-aging properties which will reduce all your aging sign along with the deep cleansing exfoliating process. It is rich with anti-oxidant properties which help to remove damaged and dull skin cell and promote the growth of fresh and tight skin cells. It cleans your pores, removes makeup and ensures more healthy and smoother skin. This face cleanser or face wash is rich with organic MSM and Vitamin C which prevents breakout, acne, sun damages and promotes healthier radiant glow skin tone. It is free of paraben, alcohol, and sulfate. It contains Aloe Vera, rosehip oil, tea tree oil, MSM, orange peel powder, oregano, borage and other natural plant extracts. All its ingredients are rich with anti-bacterial which ensures safety and care of your sensitive skin. Those who have used this product have a very positive opinion regarding its tremendous effective feature. They found an amazing reduction in their aging-related issues along with smoother, toned, wrinkle-free radiant fresh look. Its sun protection feature is one more added advantage for its users. It cleans your deep pores, makeup and oil balance of your skin. It prevents acne and sun damaging. It reduces wrinkles and breakout. It prevents discoloration and promotes even skin tone. It maintains the oil balance of your skin with its oil content. It keeps your skin moisturized to avoid dryness. It is rich with anti-bacterial properties. It makes your skin healthy and youthful. It ensures a radiant look. It is free of harmful and toxic chemicals. Few users notice bit dryness with this product. Overall this product is cost effective as with single head expense you are getting multiple benefits for many of your skin problems. So we are recommending this face cleanser to our readers who have sensitive skin. The Era Organics Natural Moisturizing Face Wash cleans your sensitive skin with gentle care and safety. It soothes your skin cells and prevents dryness and irritation. Its essential natural and safe ingredients help to reduce the aging-related effect on your face by maintaining proper pH level, oil balance, and water intact. This is suitable for both men and women. 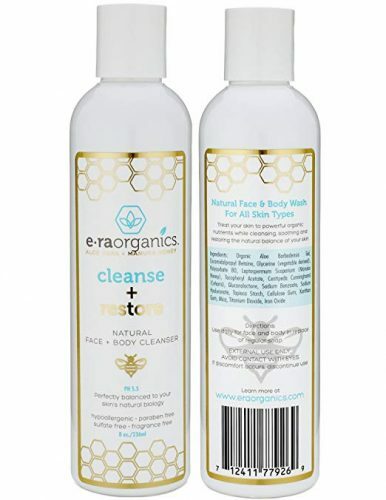 The Era Organics Natural Moisturizing Face Wash claims to repair your damaged sensitive skin by actively fighting against free radicals which are the primary cause of your skin damages. It makes your skin smoother, tight, glowing and supple. It is also effective against many skin issues like acne, dermatitis, eczema, psoriasis and pre-mature aging signs. All the contents of this face wash are laboratory tested so absolutely safe for sensitive skin. It is suitable for men and women and to some extent for children also. It is free of harsh chemicals, fragrance, alcohol, mineral oil and animal testing. Its primary ingredients include Aloe Vera, Manuka honey, Cocamidopropyl Betaine, Tocobiol (Vitamin E), Leptospermum Scoparium Mel, Cehami, Sodium Hyaluronate, Sodium Benzoate, Cellulose Gum, Titanium Dioxide, Mica, Iron Oxide etc. Its users have experienced a calming and soothing effect after the application of this face cleanser. With its essential safe and natural ingredients it ensures full protection for a sensitive skin. Also, it fights against the premature aging signs on your skin and ensures youthful, healthy and toned skin without any side effect. It helps to maintain natural 5.5 pH balance for keeping it healthy. It ensures deep cleansing of your skin pores, makeup, and dirt. It keeps your skin hydrated and glowing. It contains Vitamin A, B, C, D, and E.
It is free of paraben, sulfate, fragrance, chemicals, and preservatives. It makes your skin more toned and supple. It reduces acne, psoriasis, and eczema. Repair and heals your damaged skin cells. Moisturizes your skin with Aloe Vera and Manuka Honey extract. It restores your skin cells which get damaged by free radicals. This is a perfect product for a skin with sensitive nature as on one side it deep cleans your skin and on the other side, it keeps intact to natural oil and moisture balance of your face. Also, it further adds the moisture and necessary oil balance to make it look glowing, firm and smoother. This is the must recommendable face wash for our readers. 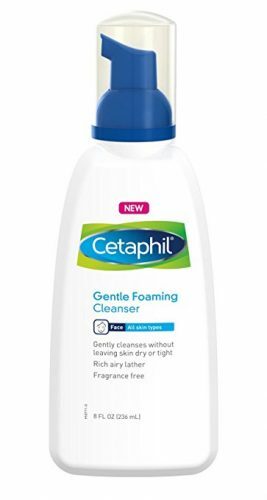 The Cetaphil Gentle Foaming Cleanser wash your face thoroughly but don’t deteriorate your natural moisture and oil balance so that after cleansing process your skin won’t get dry and lifeless. Instead, it ensures necessary oil balance and moisture content with its essential natural ingredients. It is suitable for everyday usage and for all skin types. The Cetaphil Gentle Foaming Cleanser is a dermatologist approved face cleanser which is absolutely appropriate for your sensitive skin. It claims to offer deep pore cleansing along with maintaining the moisture and water content of the skin for keeping it nourished and moisturized which is generally washed out after cleansing in normal face cleansers. It contains dermatologically tested ingredients which are 100% safe and free from fragrance, non-comedogenic and non-irritating. It helps to reduce the clogging of your pores which is a primary reason for different kind of skin issues, especially for sensitive skin. It primary ingredients include Water, Glycerin, Coco-Glucoside, Cocamidopropyl Betaine, Sodium Benzoate, Phenoxyethanol, Polyquaternium-10, Polysorbate 20, Citric acid, Tocopheryl Acetate (Vitamin E) etc. This deep foaming cleanser is a multipurpose product which facilitates its user to clean their makeup, dirt and extra oil balance in the single roof. Also, it offers after cleansing service by keeping your skin nourished, hydrated and moisturized with its Vitamin and conditioner content. It offers deep cleansing of dirt, makeup and extra oil of your skin. It contains natural and light ingredients. It is non-comedogenic and non-irritating. It keeps your skin hydrated and nourished. It softens your skin after use with its infused conditioner. Few users notice irritation in eyes. Moisturizer usage is needed after its use for reducing dryness. If you looking for a face wash or cleanser which can assure full safety and care of your sensitive skin without further damaging then this will be the right product for you. This easy to use and multi-care provider face cleanser will be a worthy purchase for everyone. So we are recommending it to our valuable readers. We hope you must have chosen your desired face wash out of our list of the best face wash for sensitive skin type. All these cleansers or face washes are loaded with several skin care features and benefit which makes their purchase a worthy shopping. 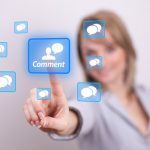 Very well-written post! You said it right that sensitive skin needs special care. 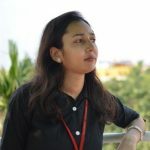 I am definitely going to try the products that you mentioned here. And I would like to thank you for the details such as ingredients and also the pros and cons of the products. I enjoyed reading it. As my skin is sensitive I prefer organic products. I recently bought an organic face mask from Ayana Wellness and it really suits my skin. Hope some of these products will also suit my skin.